Ernesto Mislej is a Teacher Assistant of Information Visualization at the CS Department of University of Buenos Aires, Argentina. For his Master's thesis he developed Cocovas: an Information Visualization system for Internet Information Retrieval (IR) systems. 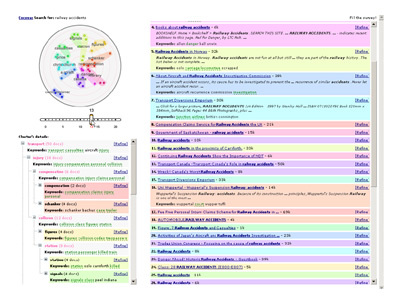 Cocovas uses a novel Visual Metaphor unifying in a single view the representation of the similarity and the relevance of document search results. As the author explains: "Regarding Internet IR systems, the opportunities to improve the recovery mechanisms are promising, making possible the application of several tasks from the process of information acquisition. 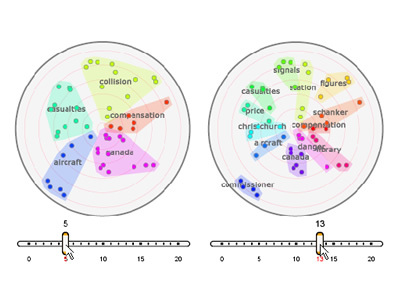 The inclusion of Information Visualization techniques allows to reach greater levels of effectiveness in the exploration of information acquiring novel knowledge and insight of data". Yes, sure! Write me an email and I will send you the source code. Greats!